Hung with the curtains, our range of decorative tiebacks add a touch of style and difference to the decor of the rooms. Luxurious designs, vivacious colors and beautiful craftsmanship are some of the striking features of these tie backs. Through our manufacturing expertise and designing skills, these tie backs can be custom manufactured in designs and sizes as per the clients requirements. 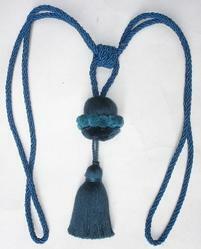 Apart from our curtain tiebacks, we also manufacture curtain tiebacks, tassel tiebacks, chair tiebacks etc. 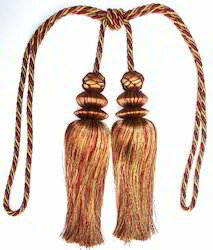 Size 15"-2" Cords & 6" Tassel. 1)Size 15"-2" Cords & 6" Tassel. 4)Different colors and styles are available. Size 15"-3" Cords & Tassel 9". *Size 15"-3" Cords & Tassel 9". *Size could be done as customer's request. 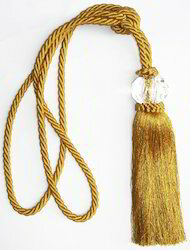 1)Size - 11" Tassel with 32" Spread. 2)Material - Polyester and Acrylic Crystal. 3)Weight - 300gms. / Piece. 5)Different colors and styles are available. 6)Variant color, size and design. 1)Size:16" & 3" Cords & Tassel 11". 1)Size:16"-4" Cords With Metal Head 2" Tassels skirt 8"
2)Curtain Tieback Made with Rayon And one of more Material. 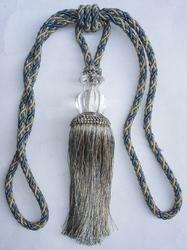 Size:9" Tassel Tieback head & 24" Spread. Size according to customer request. 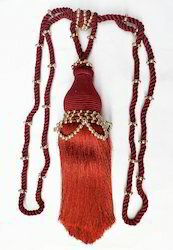 1)Size -10" Tassel with 32" Spread. 3)Variant color, size and design. 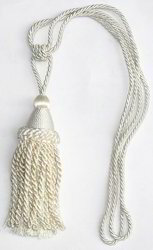 *Size - 9" Tassel with 32" Spread. *Weight - 180gms. / Piece. 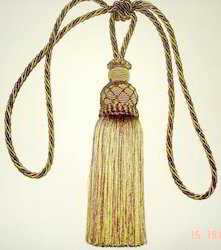 *Size:8" tassel tieback with antique wooden head , 32" spread. 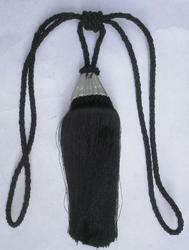 1)Size - 10" Tassel with 32" Spread. 2)Size according to customer request. Size 14" Cords & Tassel 10.5". Material - Polyester, Metal & Metallic. 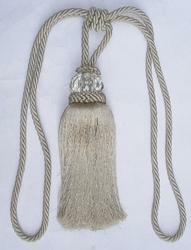 *Size:11"cord with 3" wooden ring dia & tassels 6" cotton tieback. *Any color and size we can make. 1)Size 13.5"-2.5" Cords & Tassel 9". 4)Size could be done as customer's request. 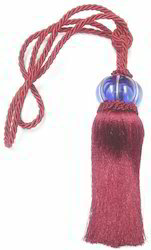 5)Curtain Tieback in many and any size as per buyers requirements in any color combination. 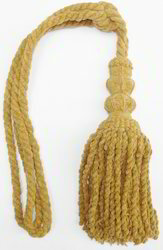 1)Size: 8.5" Tassel Tieback with antique wooden head, 32" Spread. 1)Head 1" cord 7" Rayon Elastic. 3)Any color and size we can make. *Size:19" & 4" Cords & Tassels 9". *Size 15"-3" Cords & Tassel 10". *Size 13"-4" Cords & Tassel 9"
1)Size 26.5" Length & Loop 3.5". 1)Size 15.75"-2.75" Cords & Tassel 9.5". *Size:15" & 3.5" Cords & Tassels 8". *Variant color, size and design. Size 15" - 4" Cords & Tassels 11"
*Size:16"-4" Cords Metal Head with Beads 2" Tassels SKiRT 8.5". *Different colors and styles are available. Packaging Details: Single Piece. Per Packet Individval Packing in Plastic Sleeves and Poly Bag. 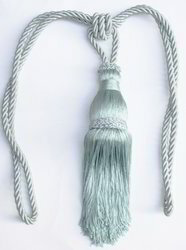 1)Size 15"-4" Cords & Tassel 11". 1)Size 54Cms.& 16.5cms. Cords & Tassel 12cms. 1)Size 15"-3" Cords & Tassel 10". 4)Lower price compared with others. Size 17" Cords & Tassel 12". Material - Polyester & crystal. Lower price compared with others. *Size 17"-3" Cords & Tassel 11". *Material - Polyester & BEads. 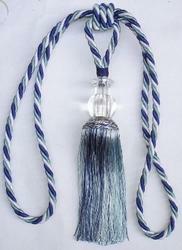 *Size 14"-3" Cords & Tassel 10". 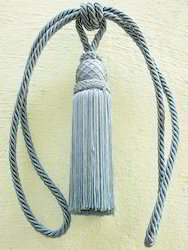 1)Size :12"- 2.25" Cords with Metal Head1.5" & Tassel 9". Looking for Decorative Tiebacks ?